Union o Burma Banner (c.1948 tae 1974). The Banner o Burma (an aa cawed Myanmar) The Republic o the Union o Myanmar adoptit a new state banner on 21 October 2010 tae replace the umwhile socialist banner in uise syne 1974. The new banner wis introduced alang wi changes tae the kintra's name an naitional anthem, laid oot in a new Constitution ahead o general elections in November 2010 intendit tae transition the kintra frae military rule tae an electit civilian govrenment. The design o the banner haes three horizontal stripes o yellae, green an reid wi a five-pointit white star in the middle. The colors staund for solidarity, peace, tranquility, courage an decisiveness. The previous banner wis adoptit on Januar 3, 1974 upon the declaration o a socialist republic in Burma bi Ne Win. Thare ar 14 stars encircling a cogwheel an a rice plant. The rice stands for agriculture, the cogwheel represents industry, the 14 stars represent the unity an equality atween the 14 member states o the Union. These socialist seembols staund for the workers an farmers. The white colour symbolizes purity, the blue symbolizes peace an integrity, an the reid symbolizes courage. ↑ "Myanmar unveils new flag". AP. Straits Times. 21 October 2010. Retrieved 23 October 2010. 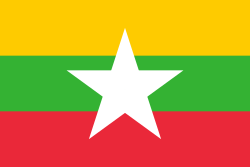 Wikimedia Commons haes media relatit tae Flags of Myanmar. This page wis last eeditit on 19 September 2017, at 17:10.